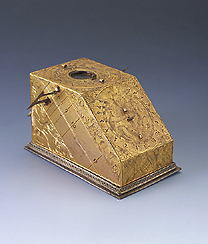 This portable dial, finely engraved and decorated, has the form of a trapezoidal solid. Each face bears a different sundial, including vertical, horizontal and declining dials. The faces are provided with folding gnomons, some of which are now missing. In the upper face is a small compass, indispensable for the correct orientation and operation of the instrument. © Istituto e Museo di Storia della Scienza, Firenze. All rights reserved. Information and images provided here may not be reproduced in any form or by any means without the prior written permission of the museum.